When it comes to keeping your hands warm in the winter during a hunting adventure there are all types of product out there. Gloves are one high on anyone’s list, but I have yet to find a pair of gloves that do the job for me. 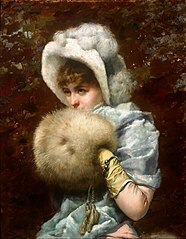 Before hunting hand muffs came into the hunting industry, hunters only had gloves to u se to keep their hands warm during the cold hunting seasons. The hunting hand muff came from a fashion accessory of long ago. Back in the 17th century, this product was just called a muff and it was designed for women. The muff is in the shape of a tube with both ends open, where the left hand would slide into the left side of the muff and the right hand would slide in on the right side of the muff. It usually was made of fur or other type fabric and it would keep hand out of the wind and cold and the fur helped to keep hand warm while outdoors. The muff has come a long way since it started back in the 17 century, there are all types of muffs out there today. They come in different colors and are called different names and all range in price from around $20 to $40 or so. What makes a muff a hunting muff? Well, it’s simple. 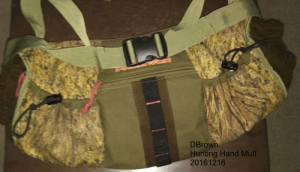 They just add some type of camouflage pattern as the outer shell, make it windproof, add some type of warm fabric on the inside, add a few other special features like ammo holders, cell phone compartment, a pocket or two for storage and there you have it. It’s now a hunting hand muff. But just because it’s called a hunting muff doesn’t mean that is the only use for it. The hunter can be used for camping and fishing or any other outdoor activity never the less it is still a muff it was just upgraded. When you boil it all down, the main purpose of using a muff it to keep your hands warm during cold weather outdoor activity. And it still works. © 2019 Hunting Hand Muffs. All rights reserved.